Yarn and Fiber Happenings: New Sereknity Perfect Yarn, More Oceania Yarn Colorways, and New Kaufman Batiks have arrived! New Sereknity Perfect Yarn, More Oceania Yarn Colorways, and New Kaufman Batiks have arrived! 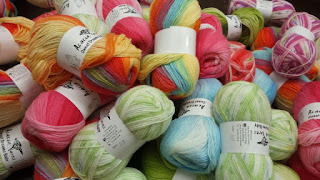 New gorgeous colors of Sereknity Perfect Sock Yarn have arrived as well as many favorites like Whattamelon, Cowgirl and After Dinner Mint! Sereknity Perfect Sock Yarn is the perfect yarn for a colorful pair of socks to delight yourself or as a gift! In fact, many buy a skein of this yarn as a gift as it is as pretty in the skein as it is knit up! Cherry Tree Hill has just shipped us a few more of the beautiful discontinued Oceania Yarn colorways! We have ordered your favorites and when they are gone, that is it! We now have more of the Spring Frost, Tropical Storm and Caribou Creeks colors as well as many more! Don't delay - this yarn is completely discontinued from the mill and will not be made again! Each generous 1440 yard skein is hand-dyed and makes a sweater or a very generous afghan or wrap! Don't delay, get your favorite colorway while they last! Are you a quilter? By popular demand, we have started to add 100% cotton fabrics to our line up and just received many fabulous coloways of Kaufmans Artisan Batiks! These colors are simply fabulous and most are from the 2010 colorcard so they are new, new, new! Order in increments of 1/4 yard and up! More to come during the summer months! Enjoy!